Since Penn Fishing Tackle Company began in 1932, Penn has continued to be an innovative and effective manufacturer of fishing reels, rods, lures, and apparel. The skill, knowledge, and passion that goes into each and every reel have set records in almost every IGFA classification. In fact, millions of anglers choose to use Penn fishing reels every day, making them a nationally recognized and trusted brand for professionals and amateurs alike. 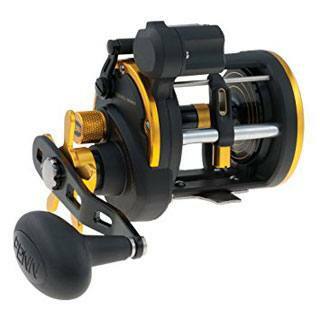 Penn reels certainly have a long history and solid record of customer satisfaction behind them, and they remain to be one of the top models for fishing reels. Though Penn fishing reels are available in spinning, baitcast, and conventional models, the quality, and performance inherent in Penn reels truly shines through their spinning reels. For those looking for the best Penn reels, it may be difficult to pinpoint which model is best suited for your fishing needs. 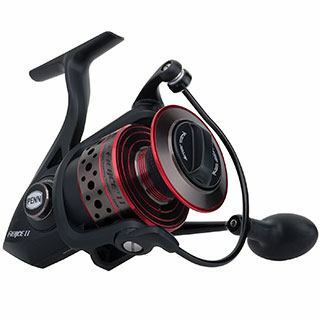 This review will take an in-depth look at the top-rated Penn fishing reels to examine the unique traits of each and every reel model, providing an invaluable guide for fishermen looking to add a Penn reel to their array of fishing reels. Penn reels tend to focus on providing high value through manufacturing reels that include top-performing models within gear ratio, drag systems, and overall durability. By looking at what components set each and every Penn fishing reel model apart, professional and amateur anglers alike will be able to determine which Penn reel is the best choice for them. Part of what makes the Penn Battle II Spinning reel into a top-rated Penn fishing reel is the attention to detail in construction. Penn reels have always been focused on providing high levels of performance and innovation, and the Battle II is certainly no exception. The HT-100 Versa-Drag washers are keyed directly into the spool, allowing both sides of the washer to be fully utilized. This allows for the Battle II model to have higher maximum drags, greater range, and an overall smoother function than competing reels. Additionally, the washers are lubricated with specially formulated Penn grease, to create long-lasting performance. 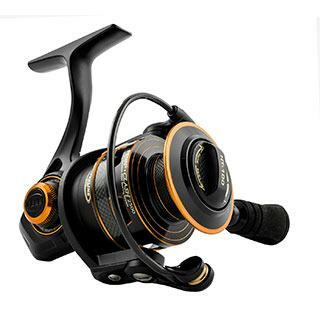 As a saltwater and freshwater reel, the ball bearings and gears are completely sealed, protecting against corrosion or damage from the elements. The 5.2:1 gear ratio falls perfectly in between low and high gear settings, meaning that this reel can easily handle light to medium weight and tension. 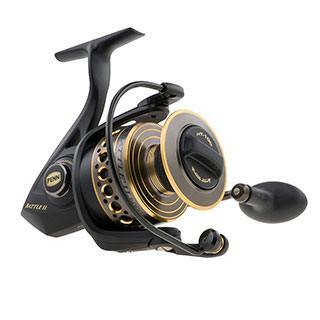 Customers love the smooth, reliable drag system, reporting that this reel can stand up to heavier fish than expected. The full metal body, side plate, and rotor offer enhanced protection and durability, but this also increases the overall weight. Depending upon the rod, at 8.1 ounces, the Battle II may feel a little heavy after prolonged time out on the water. For those looking to diversify their fishing environments, the Penn Spinfisher V offers the unique ability to fluctuate between saltwater and freshwater environments. The watertight design keeps the gears and drag system completely protected from corrosion or contamination from the outdoor elements. The Slammer Drag System includes a total of 3 drag washers to ensure that the drag remains smooth and sturdy over time. The full metal body and side plate help to make sure that gears stay in precise alignment, even when under additional stress and strain from heavy loads. The Superline Spool is made from machined and anodized aluminum, meaning that the spool can remain lightweight without compromising durability. The Penn Spinfisher V has long gained customer praise for its durability and smooth performance. 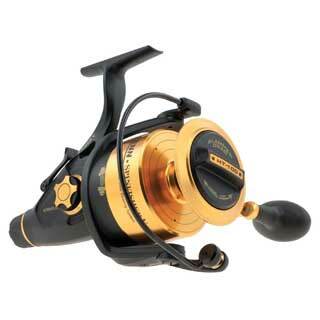 The reel comes with a few different options: Standard, Live-Liner, and Bail-less models. It also comes with varying gear ratios: 4.2:1, 4.7:1, 5.6:1, and 6.2:1. Even on light Live-Line settings, the reel may be too powerful to effectively bring in smaller fish. As a result, this Penn reel may be best suited for those chasing after medium to large species of fish. The Penn Fierce II offers high durability and rugged performance, making it one of the strongest Penn reels currently available. The oiled-felt drag system is incredibly reliable and is strong enough to hold up against the toughest conditions and the toughest fish. As an additional benefit, the drag can be adjusted even mid-fight with a fish, improving overall strength and versatility of the reel. When compared to earlier models, the Penn Fierce II has a few significant upgrades. One of these upgrades is the thicker, sturdier bail wire. With the inclusion of the Superline spool, anglers can tie braid directly to the spool without worrying about slippage in wet conditions. The retrieve rate has also been improved, with the 8000 model moving from 41 to 44 inches per revolution. With thicker bail wire, better manipulation of the spool, and effective retrieval rates, the Penn Fierce II has been reported to easily bring in freshwater and saltwater species up to—and even over—30 lbs. Available gear ratios are: 5.2:1, 5.3:1, 5.6:1, and 6.2:1. Because the Penn Fierce II reel has such a great capacity for strength and power, it is increasingly important to match this Penn reel with the right rod. Without matching the reel to a medium/heavy rod, this reel will quickly shift to absorb all the weight and friction of the retrieve, causing it to wear out quicker than expected. Models within the Penn Clash line are consistently highlighted for having long-lasting and durable performance. Each and every reel within the Clash line features Penn’s patented Dura-Gear technology, which improves overall durability of internal gears for reliable and long-lasting performance over time. The eight sealed ball bearings work with an additional anti-reverse bearing to keep everything in the correct orientation, eliminating line twist caused by high drag pressure. The HT-100 carbon fiber drag washers ensure that the drag continues to be smooth, reliable, and forceful. Gear ratios range between 4.7:1, 5.6:1, and 6.2:1. Out of all the models, the 4.7:1 carries the most impressive performance, with a 40-inch retrieve rate and a max drag of 30 lbs. Customer reviews offer steady praise for the smooth drag system and the overall lightweight quality of this Penn reel model. Though the washers, gears, and bearings are sealed, the reel itself is not watertight. When looking to use this Penn reel for saltwater and freshwater environments, anglers will want to ensure that the reel is properly cleaned, especially after saltwater use. This will prevent corrosion or damage to the outside of the reel. This line of Penn fishing reels are the successor to the original GT series, and the Squall Level Wind series marks some impressive improvements on a tried and true trolling favorite. Compared to the original GT series, the Squall line of Penn reels features a more compact and lightweight construction without sacrificing the overall durability of the reel. The addition of improved gear ratios and the instant anti-reverse feature makes the Squall series a competitive addition to the Penn reels family. The level wind function ensures that fishing line stays secure and taught even when dealing with windy conditions out on the water. Perhaps the most unique element of the SQL50LW model is that it comes with switchblade lugs to enhance smooth drag and retrieval. The Star drag system ensures that the reel can withstand tension from tough fish species, making it the perfect option when trolling for medium to large catches. Though some reels come with automatically adjustable handle positions, the Squall Level Wind reel does not. The SQL50LW model comes with a right-hand configuration, with other models fluctuating between left and right-hand setups. Overall, Penn fishing reels offer high levels of value at affordable prices, making them one of the most competitive brands available on the market today. 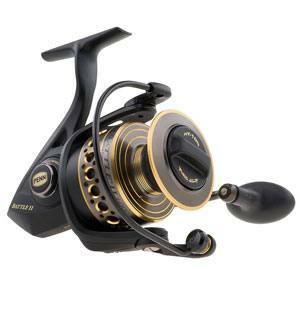 Choosing the best reel for you means taking a close look at the highlighted components of Penn fishing reels. When looking for a high-quality trolling reel that stands up to heavy pressure, the Squall Level Wind reel is an excellent option. For anglers looking for a spinning reel for saltwater and freshwater fishing, the Spinfisher V may be the best overall option. Regardless of the reel that you choose, anglers of all backgrounds and experience levels can rest assured that investing in a Penn fishing reel means investing in decades of proven quality and performance.